In April 2008, the Board of Chosen Freeholders awarded a 12-month contract to Janus Solutions of Hopewell Township. The award was based on a number of criteria, including price, quality of experience, technical capabilities to perform the project, qualifications of key personnel, approach to the project and previous performance. Janus submitted the lowest-priced proposal while also scoring the highest on an independent evaluation of the seven proposals that were received. An internal Strategic Planning Committee was established – comprised of personnel from both inside and outside county government – representing various interests and disciplines in business, local communities and government. The Strategic Planning Committee was responsible for evaluating the county’s strengths, weaknesses, opportunities and threats, for the consideration of public input and for the groundwork related to the creation of the county’s strategic plan. In a separate, but similar effort, the county also embarked on a project to audit its information technology (IT). This IT audit was conducted by Monmouth University with an eye toward increasing productivity and lowering costs. The work, done at no cost to the county, included the development of an integrated information technology plan. 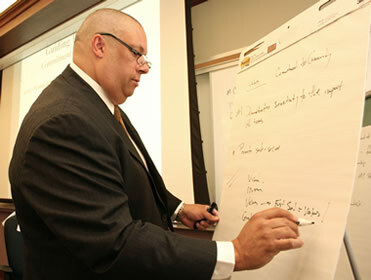 Former Freeholders Clifton and McMorrow served as co-chairs of the county’s Strategic Plan Committee.